The Patterson Bigfoot Film…Other Places the Mysterious Object Can Be Seen in the Film. The image above is from the first walk sequence. This demonstrates that the object was by her left side early on in the filming. The image above is a bit harder to see but I believe that the object is visible at the lower extremity of the arm on the left side. Perhaps this might explain why she would have a chunk of hair in her left hand in frame 352 above. I will be carefully scrutinizing the film to see how many times this object can be seen. The Patterson Bigfoot Film…A Mysterious Object on Patty’s Left Side. Patty’s hand is not holding the object. It appears to be suspended at her left side. It is seen several times during the running of the film but with the newer High Def version of the film, it can be seen much clearer. What is it? The Patterson Bigfoot Film…All Clear Frames From the Second Walk Sequence. 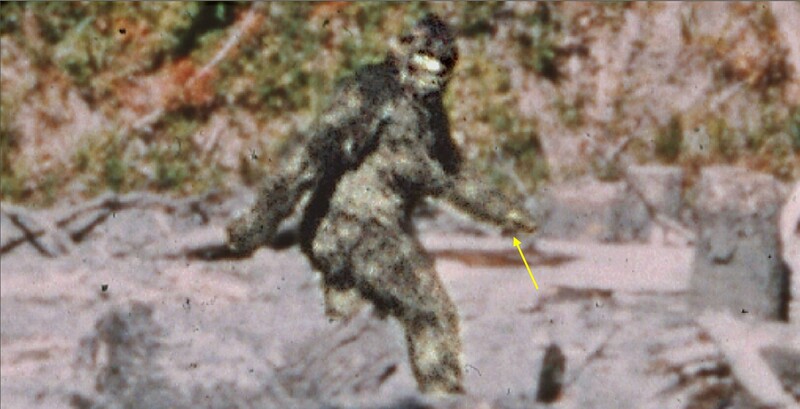 The Patterson Bigfoot Film…more frames added. Enhanced, deblurred and stabilized. The Patterson Bigfoot Film. Back Muscles in Motion. Look at the tremendous amount of motion of both muscle and skin in this short clip from the Patterson film. The Patterson Film…Deblurred, Enhanced, With More Frames Added.